The workshop in Milan has been regularly organized and has, through the years, represented a high-quality event offering a meeting place for the Nordic and the Italian travel industry. This year the workshop was also held, for the first time, in Rome, in addition to Milan. All in all, 120 representatives from Italian tour operators and 44 Nordic participants participated at the two venues. The workshop in Milan has been regularly organized and has, through the years, represented a high-quality event offering a meeting place for the Nordic and the Italian travel industry. New for this year was the workshop in Rome. The Nordic Workshops are organized in collaboration with the Tourist Boards of Denmark, Finland, Iceland, and Norway. Face-to-face meetings with business partners are considered very important in the Mediterranean countries and the workshop offers a unique opportunity for the Nordic companies to get in contact with the Italian tour operators, to introduce themselves and to present their products. 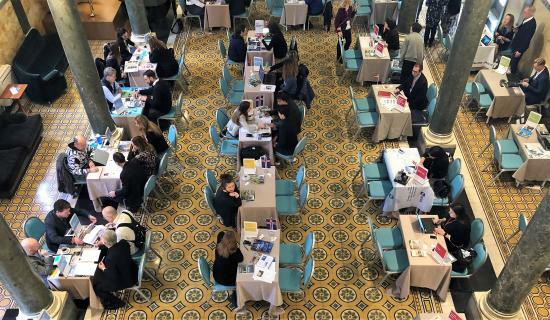 The workshop in Rome the 20.03.2019 was very well received from the Romans, and as many as 30 tour operators, with 38 representatives visited the event. The workshop in Milan was organized the 21.03.2019 and the buyers coming from all over the Northern Italy, represented tour operators covering all targets and segments of the market: from tour operators specialized in groups interested to classic itineraries to operators specialized in niche activities such as fishing, hiking or photographic workshops. Many requests also from the green segment. The Nordic Workshops are the perfect opportunity to get in touch with some of the most qualified Italian tour operators, and these days great success with a record of participating shows that the Italians are more than ever interested in Norway as a tourist destination. Elisabeth is Market Specialist, Visit Norway, for Innovation Norway Italy.